In June, Twitter announced a new feature for potential advertisers: purchasing trending topics. That means, when people use your hashtag, they see your advertisement or sponsored tweet at the top of the list, no matter what it might be. Advertisers were slow to latch onto this, but one group has pounced and picked up a hot hash tag. 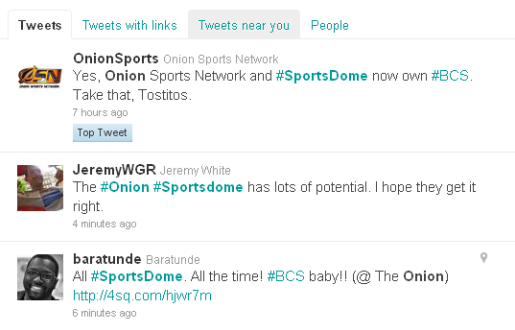 The Onion has bought the Twitter trending hashtag #BCS in the run-up to the BCS title game between the Auburn Tigers and Oregon Ducks. I have to admit, as marketing stunts go, it’s a pretty good one. #BCS is going to be a huge trending topic, and for a sports show to take out that kind of ad is genius. Almost Old Spice Guy genius. Adblock will block normal ads, but not a sponsored tweet.